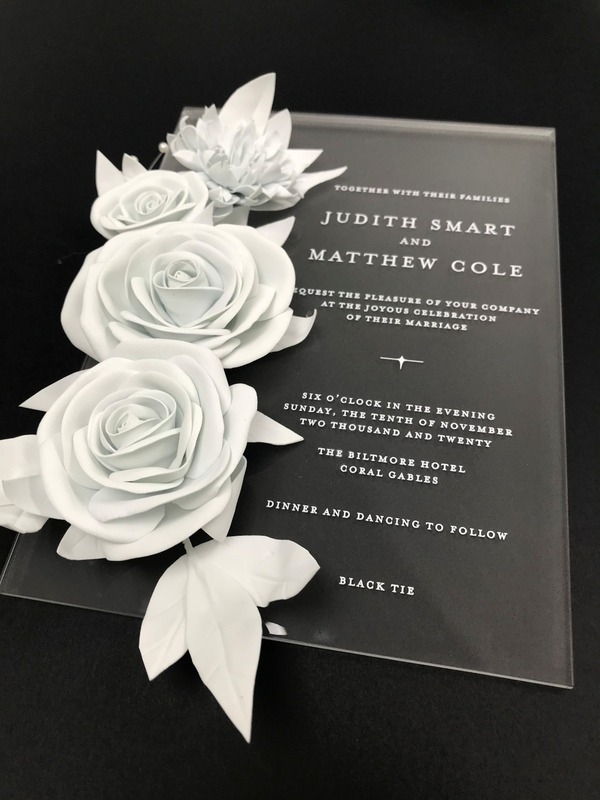 Frosted acrylic wedding invitations with UV white print and our beautiful hand made foam flowers available in any variety/color/combination. 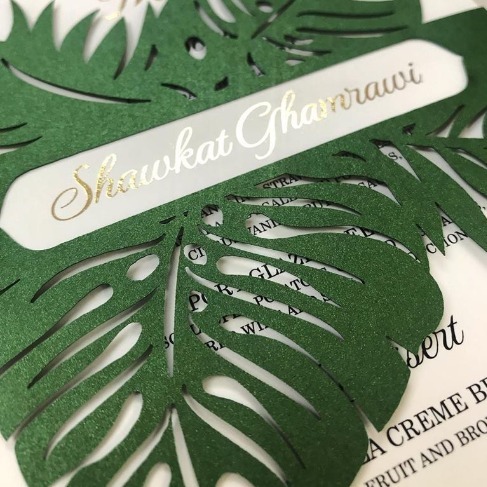 Laser cut tropical wedding menu! 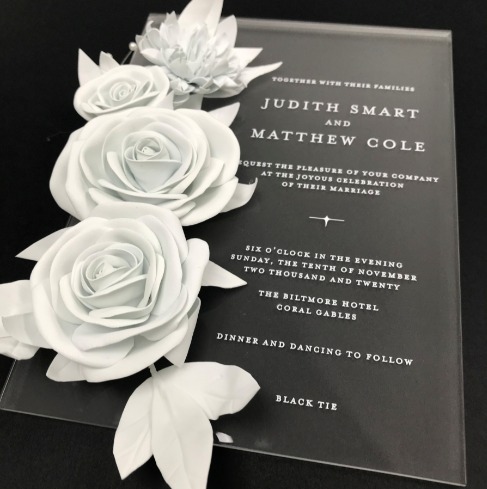 Sometimes less is more and we just love how sleek these shimmer silver & matt black invitations look. Printed on super-thick card with cool black edges. We can customize with any color combination and design for your event. Pretty sharp for our uber-cool @invitorium couple! 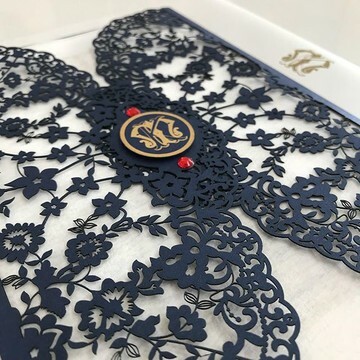 Our beautiful boxed scroll invitation is perfect for a Royal Wedding, Quinceanera or Sweet 16. The box is printed with gold foil with black rhinestones applied and a custom monogram created just for your event. 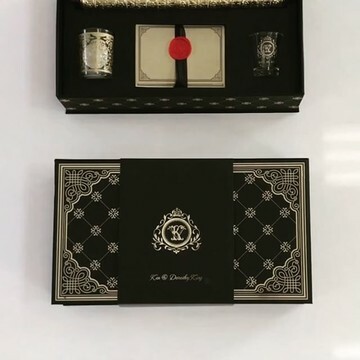 The black velvet scroll is printed with metallic gold foil and tied with a gold tassel string, and has brass dowel caps. 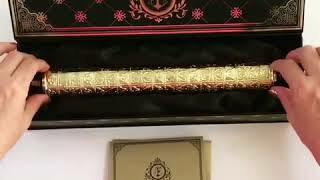 The scroll is encased in this beautiful embossed gold metal tube and set on satin covered laser cut foam base. All enclosure cards custom printed. We can custom design in any color scheme to complement your event..we have the metal tube in gold, silver and copper for rose gold color schemes. 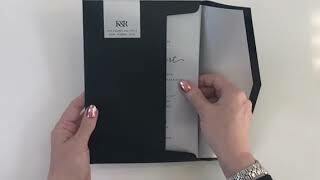 We add a customized belly band for each guest, wrap in tissue paper, wax seal with your monogram and ship in a protective corrugated mailer box with custom printed address labels. So extra! Sneak preview of our gorgeous laser cut pocket hand-drawn from the lace of our @Invitorium bride’s amazing dress! Dreaming of a tropical wedding? 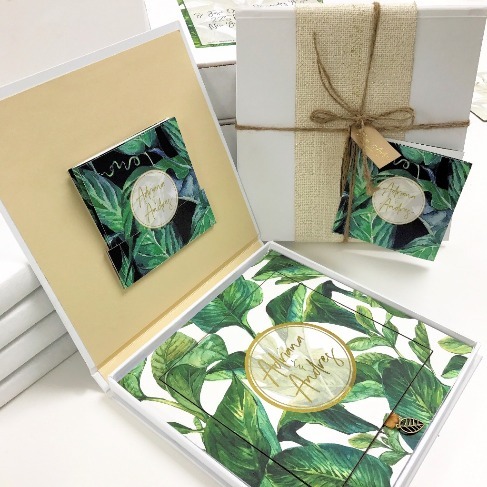 Our beautiful streamline boxed tropical invitations come complete with decoration and full personalization to complement your event theme. 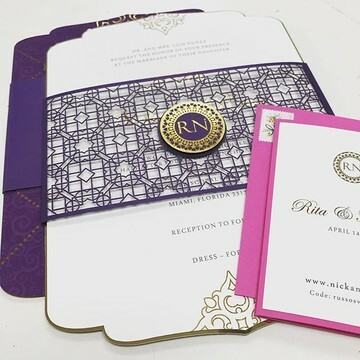 The center section of this design is laser cut in order to lift out and the invitation details are printed on the back. Under the lift-out invitation, there is a layer of fabric which matches the wedding table coverings - so coordinated! Wrapped in a layer of gold thread fabric and finished with twine and a personalized tag. Divine! The ultimate invitation to send announcing your 20th Wedding Anniversary party! 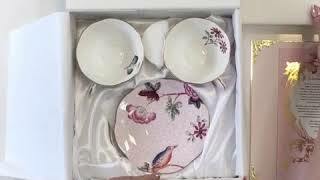 20 years is traditionally the china anniversary so we included a pair of the prettiest Wedgewood china teacups and saucers as a gift to each invited guest. Our boxes are custom designed and decorated to complement your event and you can provide your gifts or have us source them for you. All packaged with love and care with foam and satin. These invitation and enclosure cards are printed on super-thick stock with gold foil and gorgeous embossed metal corners for added bling. Totally OTT! The full reveal of our spectacular black and gold boxed wedding invitation. This production still makes my heart skip a beat!